Every business wants to have good standing in the community, and the most effective way to maintain this is with an established customer base and a confidence that defines your company as a leader in your industry. Building an image for yourself through online reputation management can draw clients to your company and help you stand out. Here are a few things to keep in mind while molding your reputation. Multiple groups ultimately have the most say over how your company is perceived in the market: you, consumers, employees and investors. The people you do business with tend to be prone to persuasion – good and bad. As a business, it is up to you to address reviews. When managing your online presence, focus on creating a game plan to respond to reviews within 24 hours. Likes and shares on comments can be your best friend or your worst nightmare. Be grateful for positive commentary, and do your best to cordially direct any negativity in a helpful manner. The goal is to become the guru of your industry. Through interaction and communication, you can become the main source of knowledge for customers with questions, which can eventually build up your client following. A negative comment can do a lot of damage to the reputation of your company. An inquiry should never go unanswered either. Doing so could leave potential customers hesitant about coming to your company for help or services. Instead, turn this into an opportunity to restore any lost credibility. Rather than focusing on the problem, offer solutions and emphasize the importance of customer feedback. Keep everyone in the loop about how your company is going to fix things or implement changes. Keep an eye on what consumers are buzzing about. When they are communicating about something good in your company, play off the positive vibes. For bad things, include support, fixes and changes you are working on presently. While reviewing comments, notice patterns developing within the forums. Are people reacting poorly to a change? Are clients excited about a promotion? If multiple customers are emphasizing a particular item, you should turn your attention to that. See where it may lead you for future decisions. Take the reins on content. Communication goes both ways. While customers can send in reviews, your business can launch content to form a community of interaction. Various media with relative industry topics, new innovations and positive changes that could affect your customers can attract attention. Keeping your audience engaged will not only keep current clients busy but also lure in new ones too. 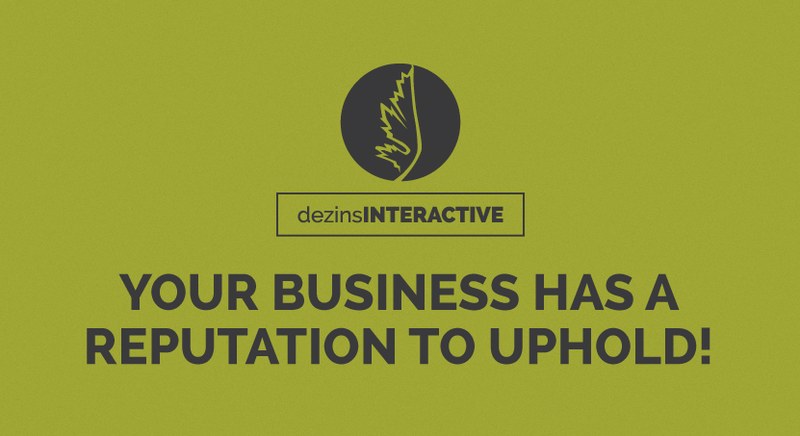 dezinsINTERACTIVE can help your business build a bigger and effective reputation in your community’s market. Through our web design and social media strategies, you can stand out of the crowd. Contact us today for more information.